I was recently up in Haliburton to visit family, and had an opportunity to hit the water for a couple hours on a Sunday morning. Part of me like the short outings, as the expectations are low, but another part of me feels that an hour and a half is never enough! I went out with my father and step brother, with no real targets in mind. We launched at Head Lake, where we would end up fishing, but Head is at the top of a 5 chain lake, so the options were varied. I’ve been having some luck with a few new baits this year, and one of them is the Storm Arashi. I like it for three main reasons. First off, its a shallow runner, meaning say 5 ft which allows me to use it in a number of locations. Second, it can be cast a mile, so I like that I can position further off shore and cast into brush or weed edges. And finally, it has distinct action, so I can always tell if it is running correctly and know when to pull the weeds off. I was using this lure, casting at the shore and weed edges coming off the shore, when I was able to see (and feel) the hit from this muskie. Now, as far as muskies go, this is no giant, he was 30-32 inches (I didn’t bother measuring since is wasn’t a trophy), but it was in great shape with great markings. These lakes have great muskie in them, so I wasn’t surprised to catch one, but I was surprised to add yet another species of fish I’ve caught with this lure. 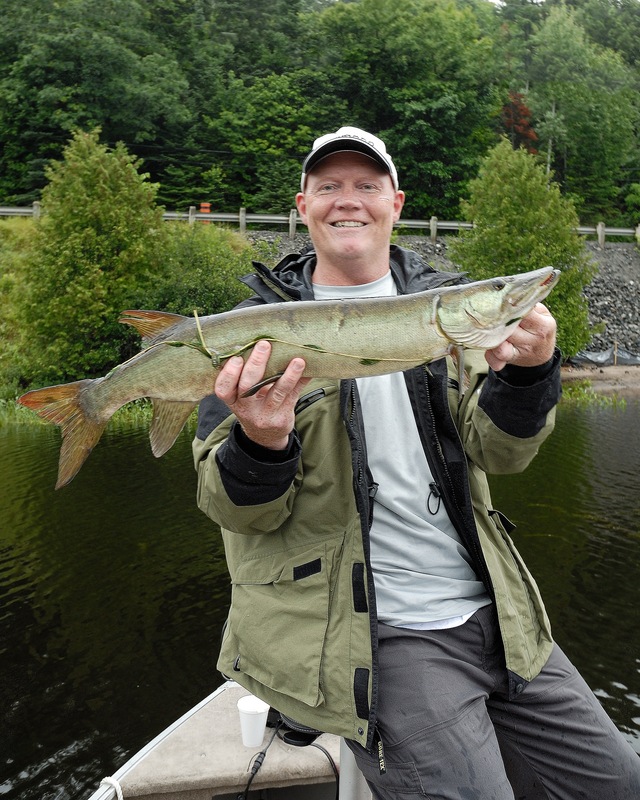 I’ve caught bass, pike, walleye and now muskie, that’s a versatile bait! Anyways, we were driven off the water after an hour by a bunch of rain, but in this case, a nice short outing landed me a nice fish! This entry was posted in Boating, Fishing, Lakes and tagged amateur, Angler, Casting, Curado, fishing, Haliburton, head lake, muskie, Pincecraft, shimano, St. Croix, Storm Arashi. Bookmark the permalink.